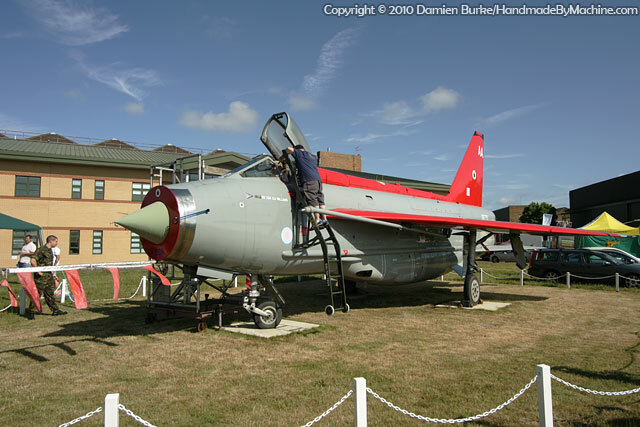 Here is XR770, one of the more famous Lightnings because of that paint scheme. She's the subject of the profile on the pictures page. First flown in 1966, she appeared at that year's Farnborough SBAC display in Saudi markings with a wide array of weaponry. Entering service with 74 Squadron in September, she finished her career with 5 Squadron at RAF Binbrook and on retirement was presented to the town of Grimsby by the station. Unfortunately the lovely councillors of Grimsby weren't awfully interested and XR770 ended up at the NATO Aircraft Museum, admittedly near Grimsby but not in the town itself. In summer 2000 she had to move on, and she went to Grainthorpe. Enter 5 Squadron at RAF Waddington who have now reformed on the Sentinel aircraft. They were looking for a suitable 'mascot' airframe to put on display by their hangar and with XR770 being an ex-5 Squadron aircraft a deal was done and in September 2008 she was dismantled and moved to Waddington. She was cosmetically restored and finished off just in time for the 2009 Waddington Airshow, and had a busy weekend hosting cockpit visits from the public. Sadly her owners, Lightning Logistics, had to dispose of her in 2015. In March 2015 she was moved to the Manston History Museum down in Kent, and by July they had completed her re-assembly. At least she is now available for public viewing - something that would no longer have been possible at Waddington with the ceasing of the annual airshow.